← This Is Your Last Chance To Preorder The Latest Parody Apparel, “TURTLE KONG”, From Strange Kids Club! Based on the best seller by author Joe Hill, “Horns” is a dark fantasy film that hits theaters this Halloween. The other day we showed you a teaser poster for the film but here is a look at the first official poster and it seems as if Daniel Radcliffe has replaced that signature lightening bolt scar with some new, creepy appendages! HORNS is about a decent enough young man named Ignatius Perrish, a guy who has always tried to do the right thing, only to see his whole life abruptly torn away from him. His girlfriend, the person he loves more than anyone in the world, is killed, and although he’s never charged with the murder, everyone, including his family and friends, believe Ig is responsible. Then one night Ig goes out drunk to rage and curse God, and when he wakes, he discovers he’s grown a pair of horns, and that people have a sudden compulsion to confess their darkest secrets and ugliest impulses to him. It isn’t long before Ig turns his terrible new powers to finding the man who killed his beloved, and taking his revenge. 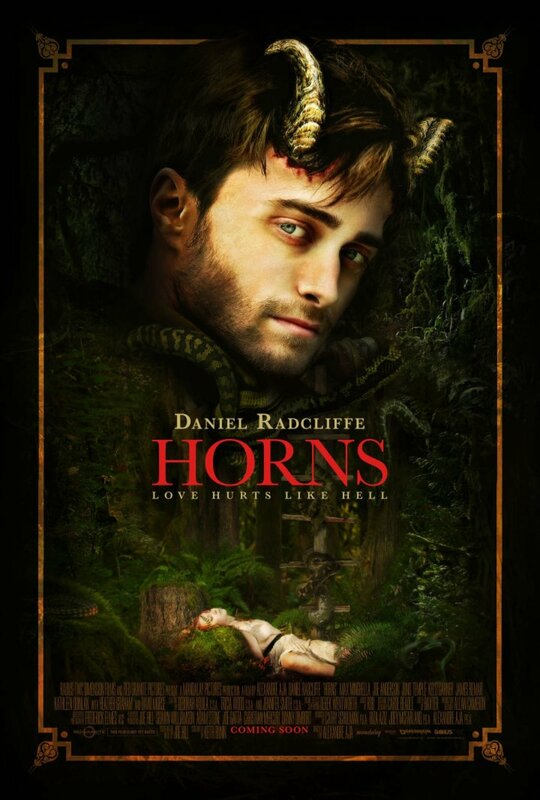 Directed by Alexandre Aja, “Horns” is coming to a theater near you on October 31, 2014 and stars Daniel Radcliffe, Juno Temple, Heather Graham, James Remar and Kelli Garner. This entry was posted in Books, Joe Hill, Movies, Posters and tagged Alexandre Aja, Daniel Radcliffe, first poster, Halloween, Heather Graham, Horns, James Remar, Joe Hill, Juno Temple, Kelli Garner, new poster. Bookmark the permalink.